As readers of this blog know, we are proud to serve as a dog bite law firm for Oakland, Santa Rosa, San Francisco, and all of Northern California. In today’s blog post, we look at a very specific category of dog-inflicted injuries, police dog bites. Although police dogs can be an important and justified law enforcement tool, there are times when police dogs attack the wrong person or are not trained in a proper manner causing undue injury to their victims. The Oakland Tribune announced this week that the city of Hayward has entered into a settlement in a lawsuit involving a police dog that inflicted serious injuries on a man. According to his Complaint, in March 2014 the man had been seated in his car in the driveway at his workplace when a police car pulled up next to him. After shining a light into his vehicle, again per the man’s claims, an officer handcuffed the man while another officer held him down with a knee to his back. The man alleged that the police then released a dog which tore at him inflicting serious injury to his arm and chin. The city agreed to pay the man $45,000 to dismiss the claim, but declined to issue any further comments on the matter. A 2006 study published in Injury Extra and available via ScienceDirect looks at the unique character of police dog bites. The authors found that police dog bite victims, unlike those involved in domestic dog attacks, were typically bitten multiple times (for a heartbreaking example, read about the Nevada incident late last year in which a police dog inflicted multiple wounds on a 17-month-old child according to the Las Vegas Review Journal). Police dogs tended to attack the head, neck, chest, and flank regions more often than their domestic counterparts and their victims were hospitalized more often, had more surgeries, and underwent more invasive testing. The authors concluded that police dog injuries tended to be more serious than domestic dog bites, likely a result of the breeds chosen for police work and the training the dogs underwent. As we’ve discussed in prior posts, California has a strict liability statute (Civil Code Section 3342) that applies to typical, civilian dog bites. There is no “First bite free” rule; owners are liable for their dog’s acts even if they had no reason to suspect the animal might attack. The owners can raise a few limited defenses including contributory negligence and assumption of the risk. 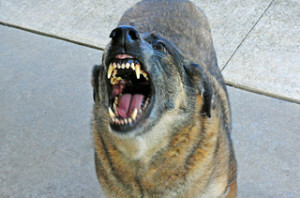 In some cases, courts have denied recovery to a bite victim who actively provoked the dog. Subsection (b) of the dog bite statute directly addresses cases involving police dog attacks. The rule prohibits a claim under the statute when a police or military dog bites in self-defense or when helping the agency: 1) Apprehend a suspect when the officer reasonably suspects the person is involved in criminal activity; 2) Investigate a crime or a suspected crime; 3) Execute a warrant; or 4) Defend an officer or another individual. Subsection (d) further clarifies that this exception only applies when the agency has adopted a “written policy on the necessary and appropriate use of a dog for the police or military work.” Additionally, part (c) of the statute makes a claim available when the victim was not part of not part of nor suspected to be a part of the acts that prompted the use of the animal. In plain English, subsection (c) means that an innocent bystander attacked by a police dog would have a dog bite claim. Importantly, while the dog bite statute does place some limits on claims for police dog attacks, those limits only apply to claims under the statute itself. This means a victim may still have a claim for excessive force, negligence, or another civil wrong. Any claim brought against a police department must comply with special procedural rules applicable to claims against state agencies. K-9 units are an important part of the war on crime. However, sometimes police dogs attack the wrong person or are overly vicious in their attacks. In such cases, the victims can sue for compensation for their injuries and their suffering. To learn more, call our Northern California dog bite lawyer in Oakland, San Francisco, or Santa Rosa. A consultation is always free and we work with victims of both domestic dog bites and police dog attacks.